Marketing theories taught in management schools, to be replaced with more dynamic concepts. 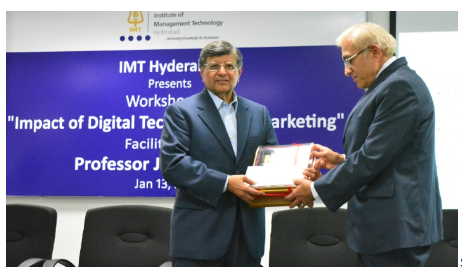 Dr. Jagdish Sheth, a renowned scholar and one of the foremost authorities in the world of marketing and consumer behavior, was at IMT Hyderabad to deliver a lecture on ‘The Impact of Digital Technology on the 4 P’s of Marketing’ along with two eminent invitees, Mr. M.R. Rao, former Dean at ISB Hyderabad and Mr. Jayant Shah, the Business Director of Academy of Indian Marketing, which is a consortium of leading management institutions offering management education and research activities through doctoral and equivalent programs. Mr. Sheth, who is an internationally recognized thought leader on global competition, strategic thinking, geopolitics, and emerging markets, has published more than 300 research papers and more than 30 books on various disciplines and topics, defined digital marketing as: ‘Anytime, Anywhere, Anyhow marketing’, which is time and place agnostic simultaneously. He began with an acknowledgement that marketing as a concept has undergone a sea change over the years and the four P’s of marketing that are being taught in B Schools currently would be largely replaced by ever-changing and more dynamic concepts of marketing. He talked about how over the years, brand loyalty has taken precedence as a whole new ball game and how it has outperformed the meagre concept of creating brand awareness. Quoting Peter Drucker, a pro marketing strategist, Seth said that the impact of digital technology on marketing has not been fully documented, even though it has been disruptive and transformative at the same time. He also discussed the huge upsurge in the intake of consumer electronics which has made a huge change in the ways of marketing, where branding has become an imaginary entity. Citing example of Netflix where pricing is done based on subscriptions, he went on to explain, how pricing structure has changed from being a static function to a dynamic function. He talked about the latent potential of digital marketing in revolutionizing and leaving a deep-rooted impact on the concepts of: Product, Advertisement and Promotions, Place and Price. He concluded by saying that traditional marketing will eventually become peripheral, whereas digital marketing will become the sole core entity. This might happen because digital technology is rapidly changing the way business is being done, and since marketing is one of the core functions of business, going digital with respect to marketing will be the right way forward. As part of IMT Hyderabad’s efforts to prepare the students for industry, 15% of the sessions in the regular courses are conducted by practitioners from different sectors of business. The Institute has a state of the art 30 acre campus situated near the Rajiv Gandhi International Airport in Hyderabad. The Industry centric approach has paid them well. More than 60% students of the current (2015-17) batch have already been placed with a highest offer of INR 22.5 lacs so far coming from a leading edge technology company. Applications are now open for 2017-19 batch.